This vanity is a great way to add traditional style to your bathroom. Made with a special white solid wood base and a beige tan marble counter, this piece will make your bathroom look even nicer. The simple look of the double-door cabinet and drawers is useful and classic. This set from Wyndham Collection is great for anyone looking for great style and function in their bathroom. Enjoy the popular traditional look in your bathroom with this beautiful vanity. The good-looking white marble counter and grey solid wood base make a big difference in your bathroom. Room is no problem with this vanity because it comes with a double-door cabinet and drawers. Put a nice twist on your bathroom project with this classic piece from Wyndham Collection. Acclaim 48-inch W 8-Drawer 2-Door Freestanding Vanity in White With Marble Top in Beige Tan This vanity is a great way to add traditional style to your bathroom. Made with a special white solid wood base and a beige tan marble counter, this piece will make your bathroom look even nicer. The simple look of the double-door cabinet and drawers is useful and classic. This set from Wyndham Collection is great for anyone looking for great style and function in their bathroom. 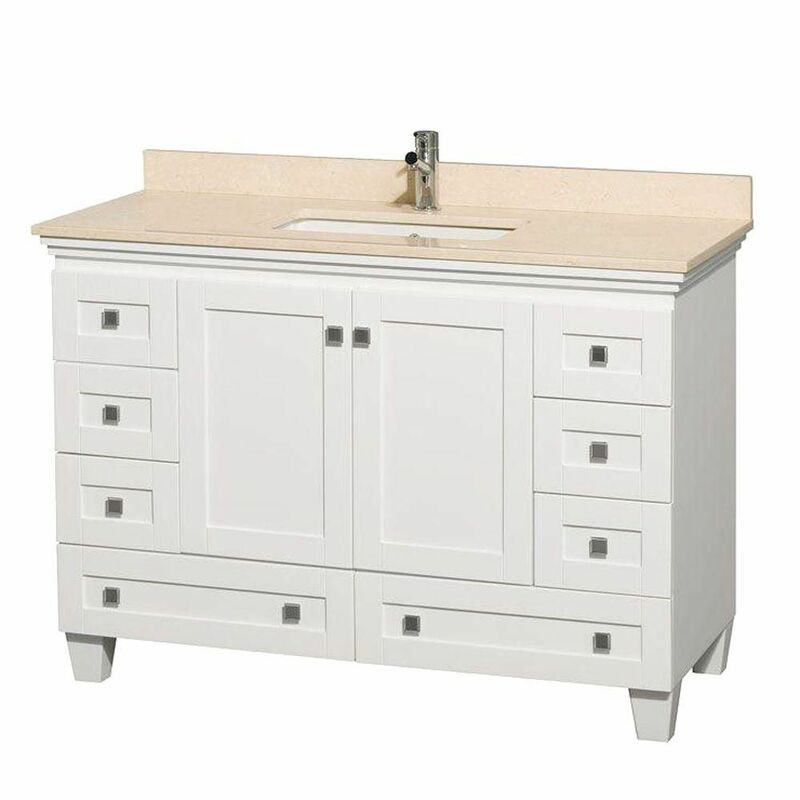 Acclaim 48-inch W 8-Drawer 2-Door Freestanding Vanity in White With Marble Top in Beige Tan is rated 5.0 out of 5 by 1. Rated 5 out of 5 by Annie from Beautiful cabinets...we bought 2. The drawers close smoothly due to... Beautiful cabinets...we bought 2. The drawers close smoothly due to the hinge system. The wood is finished beautifully. They came on time and were easy to install. We choose the Ivory tops and they are beautiful. We love this product.